"We sufis are lovers of beauty. Because we have renounced the world, it does not mean that we should look miserable. But neither do we want to stand out and attract undue attention. We do not wear special robes, because that might create a barrier between other people and us. We behave like others and dress like others. We are ordinary people, living ordinary lives. We are smart with smart people, simple with simple ones, but we never give bad example. We will always lead a life of the highest morality. We will always obey the laws of the land in which we live; but in reality we are beyond the laws of men, for we obey only the Law of God. We surrendered somewhere; we are completely free!" - Bhai Sahib, Radha Mohan Lal. 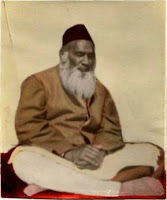 the sufi master of Naqshbandiyya Mujaddidiyya lineage from India. He left his physical body in 1966. may God sanctify his station.
. photo credit: one of the rare photos of Mahatma Radha Mohan Lal, who encouraged others to call him Bhai Sahib, in Indian language meaning, elderly brother.
. Golden Sufi carries the work of the lineage.